Includes 6 foot metal tape measure, 4 sockets, bit driver, 2 precision screwdrivers, triangular shaped level, magnetic bit holder, 3 Allen wrenches and 10 screwdriver bits. 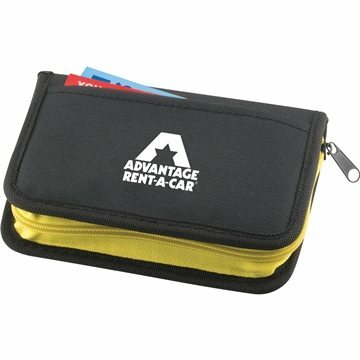 Zippered storage pouch with open-top pocket on front cover. Material: Woven nylon case with carbon steel tools. I can't say enough about the product and the logo. Definitely a good purchase. The Logo design is beautiful! I love the product!!! We order the products every year for a event! However,you really need to offer something with it!!!! thanks!!! !You helped the Celebration of 100 years begin!!!! we liked the cost of the product. there was nothing we did not like I'm extremely pleased with the outcome! Great item for the cost, ideal for our needs.